Several months ago, I wrote on our calendar for the last weekend of September: “Do not schedule a church visit!” While it wasn’t certain at that point that I would be off-call in time (babies can be unpredictable, and I had six due in September!) I was hoping we would be able to make it to the Toronto area that weekend for a family reunion that would include not only my parents (who live in Victoria) and my two older children (who now live in Ottawa) but also relatives from other states, Israel, and Australia who I haven’t seen in many years. It wasn’t until after all but one of the September babies had arrived (in plenty of time) that I realized that St. George’s Anglican, the only Reformed Episcopal church in Canada east of the Rockies, is only half an hour away from where we would be staying. Mountsberg Church building in Westfield Heritage Village. As it happened, St. George’s congregation were meeting for morning prayer that Sunday at Westfield Heritage Village, a living history museum. This was less than ideal for a missionary visit, but Rector John Ferns and his parish welcomed us warmly on short notice despite these prior plans, giving Matt time to speak to the congregation and putting out our brochures and prayer cards. 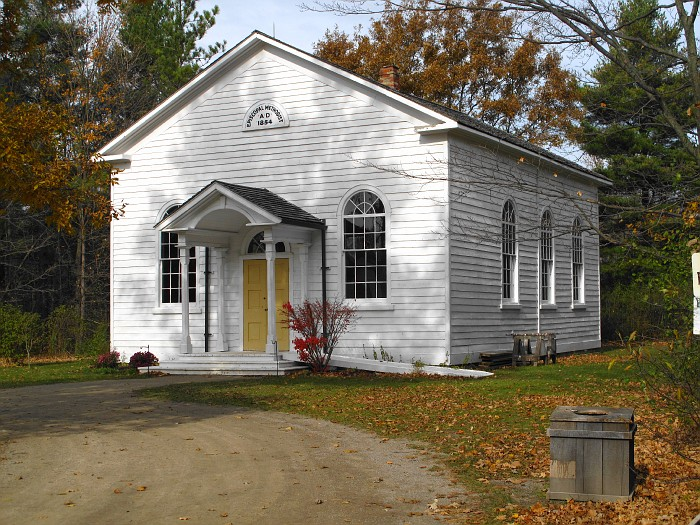 We worshiped in the (unheated) Mountsberg Church, circa 1854. The rest of the Heritage Village looked like a fun place to spend more time exploring, but I had not brought sweaters or jackets for the children and they were shivering by the end of the service, so we were glad to return to St. George’s own building in Hamilton for an excellent lunch. Alas, we were so busy talking to people that we forgot to take any pictures of our visit! This entry was posted in Looking for Senders.